Is minimalism ready to release its grasp on the design world? Wallpaper sure thinks so. Bold colors. Floral shapes. Tropical themes. It was out. It was in. It was out. And guess what, now it’s coming back in a big way and we couldn’t be happier about it. Fashion is never finished. Neither is interior design. Move over minimalism, you had a great run. TL;DR — welcome back, wallpaper. We kinda missed you. If you were out living your life and missed our last post, let’s get you caught up. We’ve been taking a look at hospitality spaces that are sparking design trends via social media. This internet fad is having a major impact on the design world. Trends are spreading faster. Some good. Some regrettable. Designers are able to find more inspiration from more sources than ever before — adding more colors to their metaphorical palette. The result of this is a wave of creativity and risk taking which really is without precedent in most of design history. Except maybe in the Renaissance. Those guys knew what was up. Wait, what were we talking about? Oh yeah - WALLPAPER. Wait, what were we talking about? Oh yeah - WALLPAPER. This week we’re looking at the explosive popularity of wallpaper in restaurant and hotel interiors. If you’ve been out to eat in the last six months, and we hope you have, or if you’ve stayed in a hotel or even a high end Airbnb, chances are you’ve laid your eyes on a nicely papered wall. Maybe you noticed. Maybe you didn’t think twice. But now that we’re talking about it, you’re going to start seeing it everywhere because that’s just how that works and by the way you’re welcome. And so but here’s the thing: wallpaper is polarizing. Why? We’re putting our money on the fact that minimalism has sort of been dominating the design world lately. Marie Kondo, we’re looking at you. Like a little Japanese Mary Poppins. We’re learning to do more with less. To focus on what matters. And all of that is absolutely fantastic, but this philosophy shift has had echoes in the design world that have sold a whole lot of white paint. And maybe, just maybe, we’re hungry for a bit more color and design. Is it just us? Do you think it’s tacky? Do you love it? People are pretty split, but the trend does seem to be sliding in wallpaper’s direction. 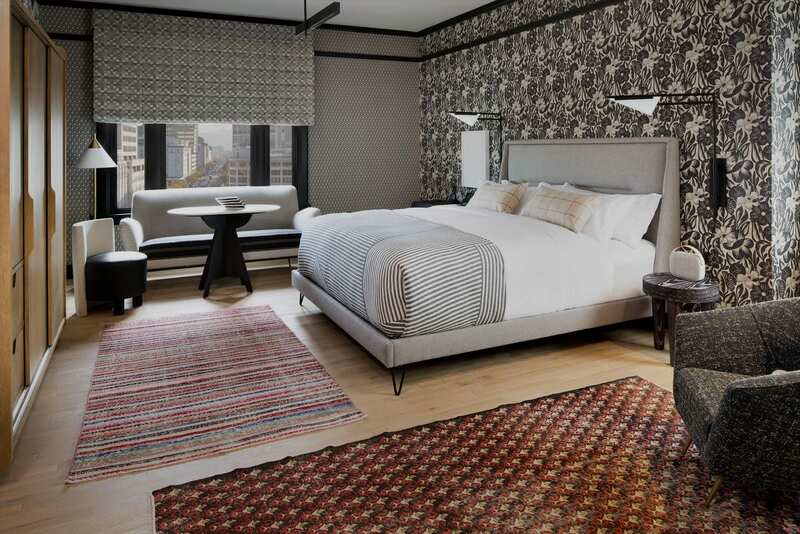 Just a few months ago, The Proper Hotel, the first outpost for a new chain of hotels designed by Kelly Wearstler, opened in San Francisco. During the opening weeks, a rush of photos featuring the heavily wallpapered interiors started showing up on Instagram. Many of the guest rooms feature varying floral papers and the wallpapers continue into unsuspecting places like the hotel gym. Because if I’m going to do my lunges you best believe I need to be looking at some sweet sweet wallpaper. It seems like no surface escaped the wallpaper treatment. 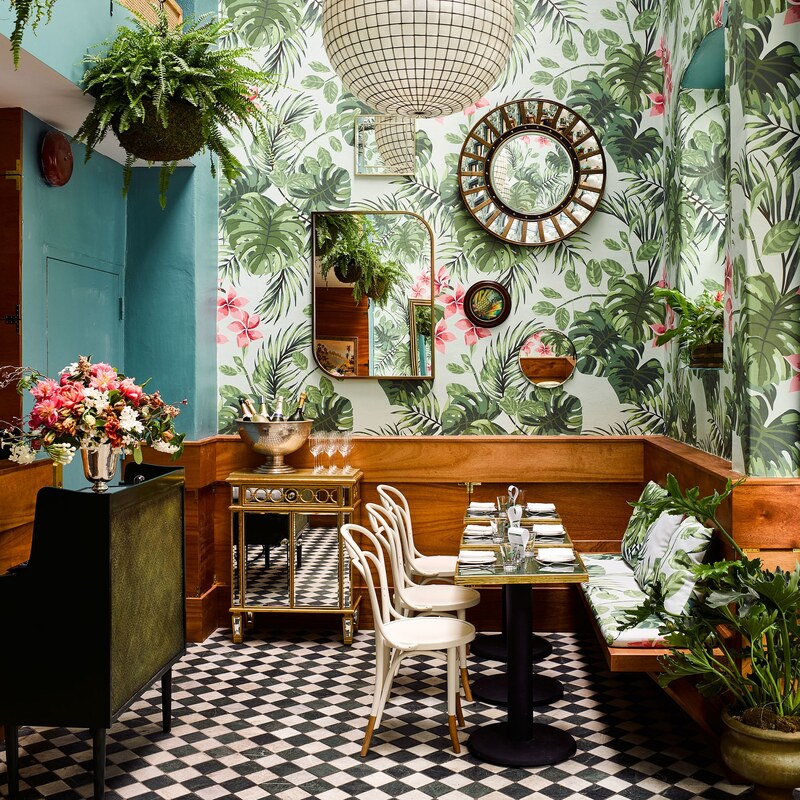 But you have to admit, it feels like a bold new take on the wallpapers you’d find in some of San Francisco’s famous Victorian homes, and frankly, we’re into it. So I guess we’re taking a stance. And that stance is pro wallpaper. You with us? And maybe, just maybe, we’re hungry for a bit more color and design. Diners at Felix, one of Venice’s most exciting new places to put food in your mouth are treated to these amazing green florals in the main dining room and, based on all the tagging that’s happened on IG, they don’t seem mad at it. It’s the wallpaper at this hotspot that somehow reminds us of an updated take on Grandma’s adorable kitchen. Maybe minus the smell of cigarette smoke. Sorry Grandma. We still love you. And we have a feeling that’s exactly what the designer, Wendy Haworth, was going for. Arguably the biggest wallpaper story came a little over a year ago when images of San Francisco’s Leo’s Oyster bar, by Ken Fulk, began infiltrating your Instagram feed. It was the image of the tropical floral feature wall that everyone wanted to snap. And since its premier, there have been dozens of copycats, and it’s pretty obvious why. I mean, just look at that. I want to move in and sleep under the tables and never leave ever again. There’s no doubt these eye-popping papers create a statement and make for some great backdrops for those selfies we all love, but at the end of the day (and the blog post), you have to wonder about the longevity of such bold choices. Like I’m sure those shoulder pads looked SUPER dope in 1986, but now...not so much. So what do you say, are these wallpapers where design is headed, or will we be scraping the walls for a redesign in a year or two? Asking for a friend.